As if out of nowhere it has appeared. Bernard’s Magic Shop, long a feature of the CBD and a Melbourne icon, has magically made its way to a new home in West Melbourne. Yet for once the question of how this happened is not shrouded in the sense of mystery that tends to accompany the world of magic. This is one of those rare opportunities where a magician is willing to reveal their secrets. This is the story of Bernard’s Magic Shop. Ever since it opened its doors in 1937 Bernard’s Magic Shop has been helping magicians get their start in magic. Today it is the oldest and one of the few remaining magic stores in Australia. Kristina’s love of magic, however, came long before her involvement with the store. Her interest in magic began at a young age but remained a dormant passion for many years. It wasn’t until a friend introduced her to magic conventions that she became embroiled in the art and its community. Starting with an audition as a magician’s assistant, Kristina, who goes only by her first name, has had a performing career lasting over 20 years. She has toured Australia and overseas visiting places like Hong Kong, Fiji and Singapore, as both assistant and magician. To run a store like Bernard’s “you have to love magic”, says Kristina, and it was that same love of magic that caused her to move Bernard’s to its new home on Victoria Street in West Melbourne. With rental prices spiking in the CBD Kristina had to pull a rabbit out of her hat, so she made the move to West Melbourne to ensure that this piece of heritage would be around for years to come. Besides rental prices another issue facing Kristina and other small businesses today is the growing market for niche products on the internet. Kristina assures any potential magicians that while it may sometimes be quicker to jump online than to take a trip to your local magic shop she is happy she is there to give the advice customers wouldn’t otherwise get online. Sixteen years ago Kristina started the Bernard’s Junior Magicians Club. With ‘YouTube magicians’ being a growing trend Kristina felt that sometimes kids were being taught to focus too heavily on the trick and not enough on the performance aspects of the art. The aim of the Bernard’s Junior Magicians Club isn’t to teach kids magic but to take the magic they already know to a performance level. To help them transform from someone who is capable of doing a card trick into a performing magician. Bernard’s has a long tradition of producing performing magicians. Perhaps the most famous of those was Alfred Gertler, though most would remember him by a different name. “The whole Bernard’s thing came about when Lionel Aarons and Bill Johns named the shop after their friend Bernard, who was always lucky,” says Kristina. “Twelve months later they sold it and Alfred Gertler bought the store. The Junior Magicians Club meets at Bernard’s on the first Saturday of every month except January, and competitions are held in December. Kristina says that as a child she found it hard to make inroads into magic because it was so male dominated, and is proud that the Junior Magicians Club has a strong showing of girls. In fact, five out of the six trophies given away at last year’s competition were taken home by girls. No longer surrounded by smoke and mirrors, for the residents of West Melbourne the world of magic is just a short walk away. 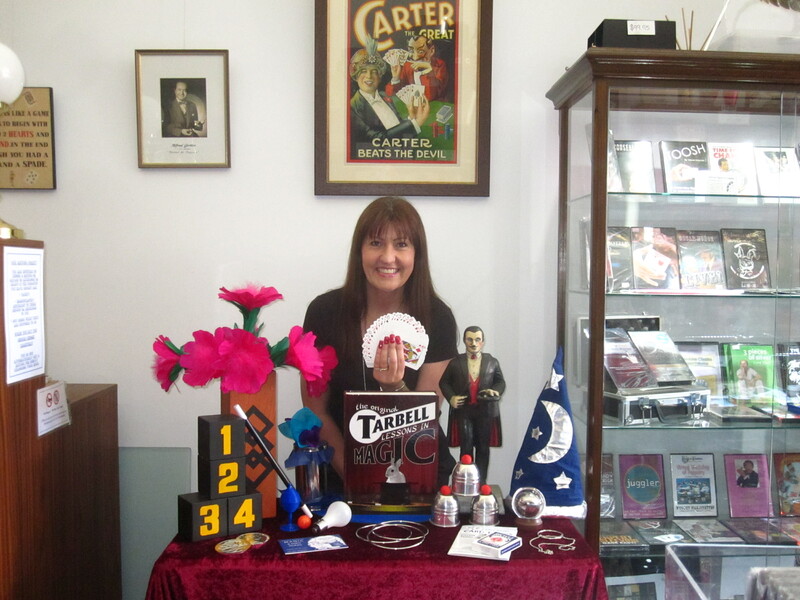 Bernard’s Magic Shop is at 355 Victoria Street, West Melbourne, and is open Monday to Saturday. Reblogged this on The Lilly Bells.